The Nissan GT-R is all great and fine and dandy, but it's big, and heavy, and the engine is right up at the front. What you wanted was something sleek, something lightweight, and you wanted the engine in the middle, where it belongs. And it had to be French, for some reason. This is the Renaultsport R.S. 01. The R.S. 01 was built exclusively for Renault's own racing series, the Renaultsport Trophy, and as such it really is purely a race car. It's got a carbon fiber monocoque, over 500 horses raging out of the engine, it weighs less than 1,100 kilograms, which is light. So it should be quick. Much like a Saturn V moon rocket on liftoff was "loud." 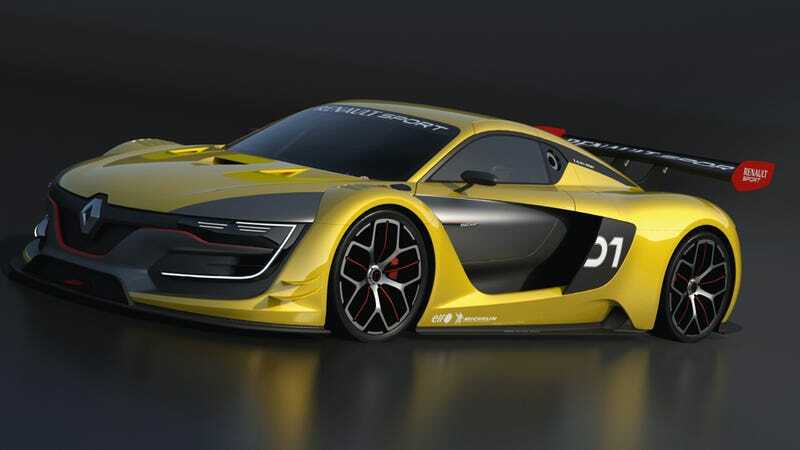 Renault specifically says it's somewhere between a GT3 racer and a DTM car, in terms of performance. It's also completely developed to LMP1 safety standards, which means that if you get into a huge crash, which you will, because the Renaultsport Trophy is for development drivers, you should be okay. Hopefully. And if you're wondering why Renault went through all the expense to develop this thing just for some rich people to try their hand at racing, you're missing the point. Well, two points. Point one is that Renault, and by extension, its corporate sibling Nissan, is planning to unveil an LMP-1 racer very, very shortly. So a lot of the money was probably already spent on that racing tub and that GT-R racing engine. Not bad. And point two is that Renault is choosing to formally unveil this to the public in Russia, because of its "special relationship to racing." And Russia, for all its foibles, still has plenty of that natural gas money. And damn, does Russian natural gas money look good in French clothing.